Since I blogged about 'Tets Research Institute' and the Ki-61-II 'Bubbletop' project of Tetsuya Inoue in June last year, he has been continuing to work his magic as a master modeler and miniature engineer. Bearing in mind the scale of his model - 1/48 - the painstaking work involved is nothing short of awesome. The latest progress is described and pictured here. Do visit Tetsuya's blog and prepare to be inspired and amazed, not just by the detail but by the absolutely convincing painting too. Did I mention the scale is 1/48? I have a sneaking suspicion that Tetsuya has a one and a half inch tall pilot waiting patiently in a dispersal hut to climb into this aircraft and test fly it when it is completed! With special thanks to Tetsuya for kindly alerting me to the progress report on this project. Really appreciate your posting my work, Nick! I’m very proud of being featured again on your great blog . 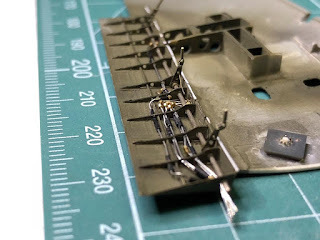 This time’s WIP has not so spectacular appearance, but I hope it’s useful for whom intending to improve Ki-61 build, because I’ve reflected all of the result of my research for Ki-61ii kai #17 of Kakamigahara Aero-Space Museum for this one year. You may find some information that you’ve never known before. Enjoy ! The one and a half inch tall pilot(His name is “Kingo”) says Hi to you all from his hut ! Thank you so much for your continuous encouragement, Dan and Ronnie!!! Stunning work, Tetsuya! I was not aware of your blog until Nick provided a link to it. Now it is bookmarked, and I will return again and again to follow your craftsmanship. Thank you for sharing your amazing work! This is phenomenal. The little chains attached to the access covers, as shown in your blog, really fascinate me. What's next, Tet? A skeleton Hien? Thank you very much for your comment Bill! I’m so pleased with you to visit and enjoy my blog ! Thank you so much Micheal! I know the chaines are a bit over-scaled, but my one and a half inch tall mechanic persisted on it! I’m not sure about my next work now, but anyway I want to build a one that I’ve never seen before! Thanks for updating us, to you & Nick.